Galveston City Hall is located at 823 Rosenberg Street (25th Street Rear), Galveston, TX 77553; phone: 409-797-3500. Photo: John Hagemann House, ca. 1893, 3301 Avenue L, Galveston Texas. Listed on the National Register of Historic Places in 1982. Photographed by User:Wikiname (own work), 2012, [cc-by-3.0 (creativecommons.org/licenses/by/3.0)], via Wikimedia Commons, accessed October, 2012. The present island of Galveston, when white men first landed on it 400 years ago, was two islands, and remained so until a storm in the early nineteenth century closed the narrow pass between them. It was almost certainly here or on the next bit of land to the west—now called San Luis Island—that Cabeza de Vaca, the first European to see the interior of present-day Texas, was wrecked in 1528. He and his companions called it Malhado (Misfortune), but after their escape from the Indians and his publication in Spain of the narrative of his journeys, it was given the name Isla de las Culebras (Island of the Snakes), and later it was called San Luis. The bay between the island and the mainland was surveyed in 1785 and named in honor of Count Barnardo de Galvez, Viceroy of Mexico. Galveston occupies the eastern extremity of Galveston Island, which is 30 miles long and 2 miles wide and lies nearly parallel to the Texas mainland coast two miles distant, with which it is connected by two vehicular causeways and a railroad bridge. A ship channel, 1,200 feet wide with a maximum depth of 34 feet, leads from the Gulf of Mexico into a tranquil, landlocked harbor on the north side of the city. Seen from the wharves, the harbor, protected by artificial moles, is alive with traffic from a hundred ports; grimy tram steamers, sluggish wallowing oil tankers, trim passenger ships crowd the docks; bustling, self-important tugs nose among the larger vessels, thrusting a fruit shop out to sea, edging a steamer gingerly to dock. Here is one of the largest cotton ports in the world, where thousands of men are employed to load cotton for foreign destinations, and to handle the yellow cargoes of sulphur and grain which compose a large proportion of the exports. Heavy imports of bananas from the tropics, jute bagging from India, and raw sugar from Cuba and elsewhere for refining in Texas, find their way into the harbor. More than half a hundred coastwise and foreign ship companies make Galveston a regular port of call. Viewed from the air above the Gulf of Mexico, rippling waves wash a smooth, wide, sandy beach, above which looms a solid gray wall of tremendous proportions, grimly guarding the city against its old enemy, the sea. Perched upon the formidable wall, and sloping toward the bay, is the city, its tall buildings relatively few and not more than a dozen stories in height, its residential and some of its business sections thickly laced with long daubs of color made by a countless profusion of oleanders—Galveston is called the Oleander City—poinsettias, bougainvillaea, and other subtropical plants. Without its characteristic masses of flowers, its stately homes and beautiful parks, and gay throngs that people the beach and sea wall, Galveston from the Gulf would convey an impression of a powerful fortress, guarding its fine sheltered harbor and vulnerable coastline from attack. Laid out as rectangularly as a gridiron, by men who approved of broad thoroughfares, the city is compact, its area unchanged since its incorporation a century ago. Vacant lots are rare. Most spaces not occupied by buildings are filled with flowering vegetation. In the streets nearest the harbor are many narrow business buildings, often with ornate fronts, that date from the days when all the activities of the city were those of the seaport. Here and along the water from surges a cosmopolitan company. Lascars from tram steamships, Cornishmen from blunt British freighters, sailors of every nationality—the city contains 27 foreign consulates—mingle with those home folk whose business takes them harborside and with vacationers from every section of the country. Charming houses of classic beauty are in the older residential sections, but most striking are unusual examples of self expression by builders in the periods of maritime affluence before and after the Civil War—men who had been in many parts of the world before they settled down to establish homes on the island, and who in designing their mansions borrowed from and combined, to suit their tastes, almost every conceivable type of architecture. 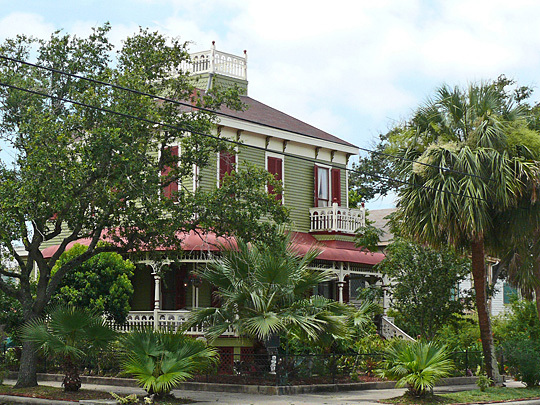 A peculiar characteristic of much of the Galveston residence construction is the raised first floor; what ordinarily would be the ground floor is a semi-basement, and the lower living floor of the house is six to ten feet above the ground and reached by an outside stairway. This is principally a survival of custom from the days when storms flooded parts of Galveston, before the sea wall was built and the grade of the island changed. Before the great storm of 1900, in no place did the altitude reach nine feet. Since then the sea wall has been constructed, 17 feet high, and back from it a great part of the city has been raised to slope gently from that level to the bay.